Truth isn’t always black and white. Sometimes it takes the unexpected to reveal its true colors. Marti has been on her own since she was 15, determined to build a life for herself and her sister despite the threats of a man intent on keeping her from revealing his secret. Sam Evans’ turbulent teen years prepared him for the perfect job—counseling troubled youth. Then his pregnant wife walked out on their marriage and his life imploded, leaving him without a family, a job, or his hard-earned reputation. With her sister in danger, they’re forced to divulge the secrets, lies, and half-truths they’ve kept hidden from each other, and from themselves. 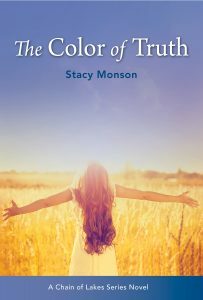 If they can’t face the brilliant colors of God’s truth, the consequences may be deadly.